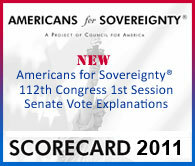 Council for America® fights to maintain the sovereignty of the United States. It is time for America to end its entangling membership in the UN and to stop funding that corrupt body. CLICK HERE to sign the petition…. "LOST is a Loss for the United States"
The vote by the Senate Foreign Relations Committee in favor of the United Nations Convention on the Law of the Sea (LOST) represents an attempt to trick the American people into accepting a fatally flawed agreement.